Originally published in 1974, a wide and interesting set of intellectual abilities in children are examined here. 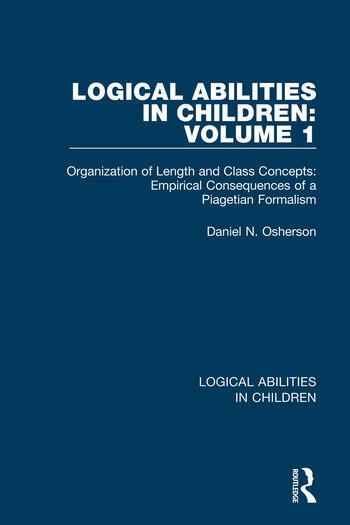 Volume 1 of 4 (Organization of Length and Class Concepts: Empirical Consequences of a Piagetian Formalism) converts an axiomatization of classes and asymmetrical relationships (proper to Piaget’s discipline of Genetic Epistemology) into a model of the development of these notions in children. Here may be one of the only attempts to derive predictive consequences from the more philosophically oriented writings of the Genevan School. Preface. 1. Introduction 2. Grize’s Axiomatization of the Grouping 3. The Length Experiment 4. The Class-Inclusion Experiment 5. The Coordination Rules 6. Theoretical Use of the Axiomatization: General Considerations 7. The Model for Length Tasks 8. Extension of the Model for Length 9. An Attempt to Predict the Performance-Factors 10. The Model for Class-Inclusion 11. The Relation of the Theory to Genevan Psychology 12. Direction of Further Theoretical Efforts. References. Appendixes. Author Index. Subject Index.